So You Want to Know Something About Us? I've been a cat lover all my life and cat "owner" for over four decades (please don't do the math, lol). Until a couple of years ago, I was blessed with two cats: Xela (pronounced SHAY-la) and Neko (pronounced NEE-ko. Both are black domestic shorthair cats. I adopted them from my local Society for the Prevention of Cruelty to Animals (SPCA). Xela and Neko made up my "feline research team" and helped me with the cat products and information I write about. Neko also likes to have input into the editorial process, so she usually keeps me company while I work on this site. They both taught me a lot about cat behavior, and about life in general. Xela, my older kitty, was named after a town in Guatemala that I visited over 20 years ago. I adopted her when she was about 8 months old. While I was visiting the SPCA, Xela made me fall in love with her by putting her two little arms around my neck with a great big kitty hug. I just had to take her home. I adopted her shortly after I had to put down my older cat, Max (also a black domestic short hair, and incidentally, the best cat that ever lived). That was in November 1994. Xela lived a good long life. Before the illness that led to her passing, she only ever had one health incident her entire life (it was right before I was supposed to leave for an all-expenses paid trip to India!—which of course, I did not go on). Neko was also adopted from my local SPCA. The SPCA people said she was "semi-feral" and not likely to be adopted. Plus, when I first met Neko, she had such severe flea allergies that she had licked off all the fur below her "waistline." The vets said she might never grow her fur back! She was a homely little kitty, and I worried about her. For about a week, I visited the SPCA every day looking for the perfect companion for Xela. I couldn't get the homely little bald kitty out of my mind, so I finally adopted her. She was very shy and quite skittish for a long while. But now, she's adjusted quite well and seems to live each day with complete joy. She is the love of my life. It took a long time and a lot of patience, but Neko is now a regular cuddle-kitty. The SPCA veterinarians guessed that she was somewhere between 1 ½ and 3 ½ years old. 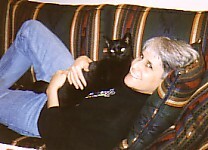 That was in 2001 and today, although she is slowing down a bit, she is still as playful as a kitten. Plus, it took years, but all her fur is back and she is extra-beautiful! Well, that's the short story about us. Besides being a cat lover (especially a black kitty lover), I'm also a former professional consumer advocate. And although I'm no longer paid for it, I still care about safe products and responsible consumerism. I wanted to combine my love and passion for cats with my personal philosophy and beliefs. 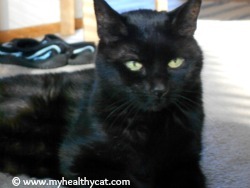 A website seemed to be the best way to share practical information for everyday cat care. Before beginning this project in 2003, I knew absolutely nothing about building a website. My only experience with the Internet was surfing it. Thanks to Site Build It! and their step-by-step instructions, I was able to build this successful site from scratch. MyHealthyCat.com is now in the top 1% of all websites, according to alexa.com (that's a website only webmasters care about). I'm learning more and more every day about cat products and feline health. 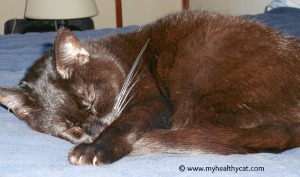 As I learn new stuff, I add it and try to and improve the information you find on MyHealthyCat.com. 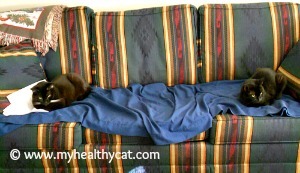 I hope you're able to find what you need here to help you keep your cat or kitten healthy and happy. You can use this Google search box to find what you need on MyHealthyCat.com. Please contact me with any thoughts, suggestions, comments, or ideas for topics you may have. I want to make this website as useful as possible for all cat lovers. Your input is greatly appreciated. You can also let me know if you'd like to know more about us. I love talking about kitties, especially my Neko! I am not a veterinarian and the information you find on this site is not veterinary advice. I've put together the information you find on these pages from some of the best available cat books, articles, and other trustworthy resources, but mostly from my own decades of personal experience. However, the information I provide is just that, information. 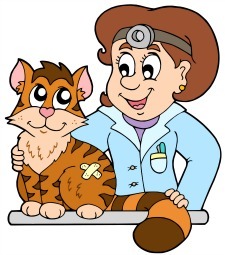 If you suspect your cat or kitten (or any other pet) is sick, please seek help from a trustworthy veterinarian immediately. Thank you for reading about us!